What teacher-actions make for effective reading instruction? 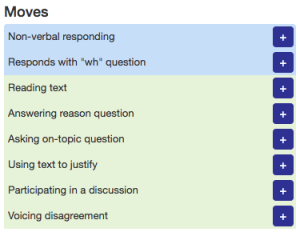 Do the types of actions and responses from students impact how children learn? Can we predict what types of teacher instruction will be most effective for a specific student? These are questions we plan to address and answer during the OLOS project. This observation system will be used by educational professionals to improve practice and students’ academic and social-behavioral outcomes. We are interested in ways to improve our students’ outcomes and believe OLOS has the potential to be an important tool for schools. To achieve our goal we need a system that uses assessment data, along with classroom observation, to collect and interpret all available information associated with child outcomes across the transition from preschool to early elementary grades. To achieve this, we are creating and evaluating the Optimizing Learning Opportunities for Students (OLOS) Observation System, an innovative, multidimensional assessment system that can be used by practitioners (principals, coaches, master teachers, and teachers) to conduct observations of preschool and early elementary general education classrooms. Working with Early Learning Network research teams, we will harness the power of technology and a user-friendly interface so that detailed information and guidance, drawn from classroom observations, will provide feedback to teachers to promote positive child academic and social-behavioral outcomes. OLOS uses three already integrated, well-validated, reliable, and effective observation systems: Individualizing Student Instruction (ISI)/Pathways, Creating Opportunities to Learn from Text (COLT), and the Quality of the Classroom Learning Environment Rubric (Q-CLE), with recommendation algorithms developed as part of our Individualizing Student Instruction (ISI) classroom intervention and Assessment 2 Instruction (A2i) technology research. 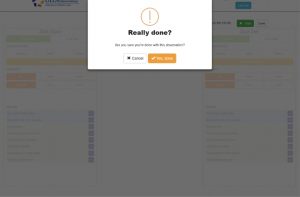 You can choose an option from WORKZONE if you want to perform a new observation or keep working on the one in-progress. 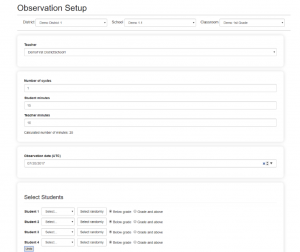 Click REPORTS to export observational data and see teacher and student moves recorded after completed observations. 2. It is time to set up the observation! 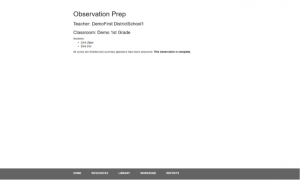 In the OBSERVATION SETUP enter school and teacher details. By choosing number of cycles and minutes, you get to decide how long the observation will last. Select students manually or randomly, based on their grade level. To capture learning opportunities, the OLOS system will allow you to choose different instruction context and content area. For each child and teacher select whether they are participating in whole class or small group/individual activities. Describe whether the teacher is actually interacting with students or children are working independently or with peers. Are some students working on math while others are reading? Content area and instruction type will help you capture in detail what skills students are mastering. Do not forget about student and teacher moves! 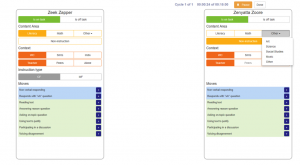 By pressing a blue button with “+” record each action that child/teacher took. 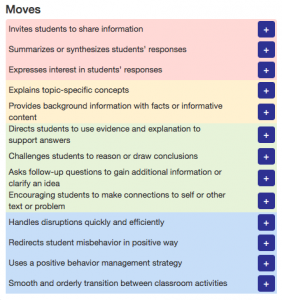 List of teacher instructional moves. You can pause the observation at any time and return once you are ready to work again! OLOS will give you a warning before quitting the observation, in case you change your mind. 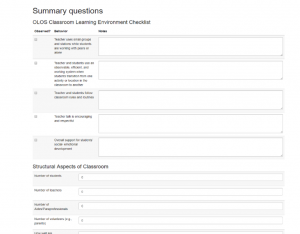 Summary questions page will allow you to describe in more detail the learning environment and structural aspects of the classroom. 7. Congratulations! Your observation is complete. Now your report is ready to download. Go ahead and see all the learning opportunities, teacher and student moves that happened during the instruction.